In December I reviewed Moosewood Restaurant; Cooking for Health which I'd checked out from the library. When I had the book I wrote down a few recipes and hoped that I might get the book for Christmas. I bought the ingredients for one of the recipes using adzuki beans because I'd never heard of them. Luckily I found them in bulk at my local organic store and it seemed like a sign. Well, you know how things go. I had those adzuki beans in a canning jar and it was the holiday season and the days got away from me. I never made the recipe but still had the beautiful beans staring at me every time I opened my dry storage cupboard. Last week I got inspired to use them but realized I hadn't copied down the original recipe. I did what everyone does; I googled a new recipe and this is what I found at Healthy Green Kitchen, a new foodie blog for me! Winnie at HGK credits Ree Drummond (do I even have to say it...Pioneer Woman) for her recipe. I made them and we've been eating them all week in different easy meals. 1. If not using aduki beans, it's best to soak your beans overnight in a large pot covered with water. After they have soaked, drain them and rinse several times. If you are using the adzuki beans just go ahead and use them. 2. Place rinsed beans and bacon in a large pot on the stove. Pour water over the beans to cover by 2 inches. Bring to a boil and then reduce the heat to a simmer. 3. Skim any foam that might rise to the top while cooking, and add additional water (or stock), if there does not seem to be enough liquid. 4. Cook until the beans are tender, about 1 1/2 hours (or as long as 3 hours for pinto and other beans). 5. Add the sea salt (don't add too much if you've used stock) and pepper, plus the seasonings I mentioned (or others that you like) to taste. You can serve these in whole wheat or corn tortillas with the toppings of your choice: think grated raw cheese, fresh salsa, guacamole, organic sour cream, etc. Or have some in a bowl with a side of cornbread (I made a pretty good gluten-free one that you can see in the top picture). Fresh chopped tomato, cucumber, red pepper, and sliced avocado are also wonderful additions. 6. My favorite healthy way to eat these, though, is this: chop some collard greens very fine, add some olive oil and fresh lime juice, and mix with the beans, veggies, and salsa. Top with some green onions and minced cilantro- yum yum yum! The first night we had them with brown rice, chopped tomatoes, a little curry sauce and whole wheat wraps. In the middle of the week I had them on top of a green salad while my children ate pasta. Last night I turned the last of them into my food processor with a little water, fresh squeezed lime juice and a few diced tomatoes with juice and created a refried bean consistency. We had soft shell small tacos using the beans as our base with freshly shredded mozzarella, avocado, tomatoes, and green lettuce from our co-op. The beans were delicious! My kids didn't even realize they were eating the leftover beans re-purposed! 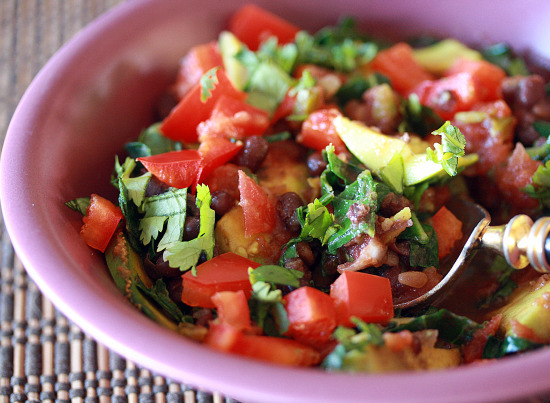 Adzuki beans are flavorful and very useful as you don't have to soak them at all. If you can find them in bulk-give them a try. 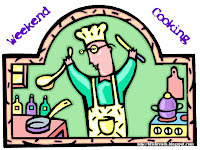 This post is linked to Weekend Cooking hosted at Beth Fish Reads. Pop over and see what other food-related bloggers are cooking up! Perfect pictorama of my life!